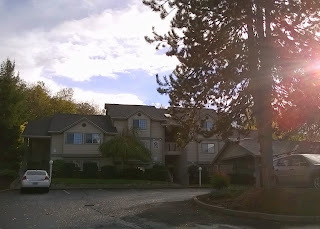 Reluctant Chauffeur: Oregon: Wrap-up and rating. On to the next city! Oregon: Wrap-up and rating. On to the next city! 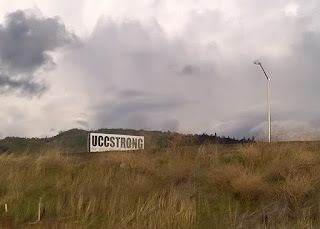 Another three months has flown by and we're getting ready to leave Roseburg for the next city. My final feelings on Roseburg and Oregon are mixed. Oregon as a whole is nothing like the reputation it often gets from Portland, but overall it's a great state. Shortly after the UCC shooting, I was reading harsh comments on-line coming from Texas and other areas in the south about "the hippies in Oregon" and their lack of guns and carry-permits. If only they new the truth! Oregon is just like any other state with the progressives in the cities and the conservatives in the country. Roseburgians loves their guns, pick-ups, and churches. The majority are downright hostile towards "liberals", Obama, and the "tree-huggers up in Portland" that criticize the logging industry and give them a "bad" reputation. I've mentioned a couple of times already being surprised by rampant obesity and confederate flags in town. But we're glad we came for three months. The coast was amazing! I could see owning a beach house in Oregon and living here a few months a year. So, as far as our experience overall, it was definitely positive and we've had a great three months. 1. All the interesting names like Thor's Well, Cape Perpetua, Devil's Punchbowl, Devil's Churn, Wizard's Island. 3. The Oregon Coast is gorgeous! 9. 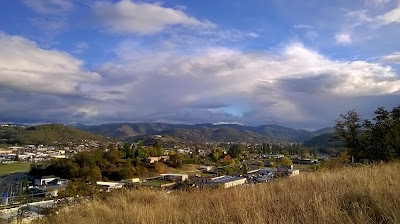 The view of Roseburg from the butte behind our apartment (pictured at top). 360 degree views. No one is ever around (unless there is a super moon) because it's being developed. Initially, we were really taking notes on each city and used the rating to talk with each other about where me might live permanently. Now, it's more for a fun conversation. Roseburg fails because we wouldn't consider living here unless we really needed to. It's the only other city besides Fresno that we haven't loved. I'll post again soon. Our next city is a good one!